ANNAPOLIS, USA (IDN) - Worldwide elimination of nuclear weapons would bring the following benefits to the USA, plus to all other states and people: freedom from nuclear war or nuclear attack, freedom from possible "false-alarm” nuclear strike, and elimination of risk that terrorists could acquire a nuclear weapon from a state’s arsenal. The question of "entry into force” of a nuclear ban treaty [convention] is critical. If an insufficient entry-into-force provision is adopted, then the ban would likely lack the signatories to be meaningful and thus fail to meet its goal of worldwide nuclear abolition. On the other hand, an appropriate provision would help smooth the way for today's nuclear weapon states to actually sign and ratify a nuclear ban treaty. Since accession to such a treaty by those states is by far the biggest challenge in nuclear abolition, the treaty should include all reasonable inducements in its provisions for the nuclear weapon states to join. Now the rationale for the above, perhaps seemingly overly-contrived provision for entry into force of the nuclear ban treaty. First, states such as the USA almost certainly will not renounce nuclear weapons unless all states (not just today’s nuclear weapon states) do the same, by joining a nuclear ban—often called a Nuclear Weapons Convention—before its entry into force. Even if a current non-nuclear state is "small" or otherwise non-threatening, it could at some future time undertake nuclear weapons development if, as a sovereign state, it is not a party to the nuclear weapons ban. Further, and also crucially, a requirement of unanimity of accession by states before entry into force would give the enacted treaty unprecedented geopolitical impact—valuable for maintenance of a nuclear weapons-free world, and in all probability necessary for today’s nuclear weapons states to agree to join the [prospective] ban. A provision of the treaty would also proclaim that upon entry into force (after all states have joined), the treaty applies "everywhere" to cover non-state realms such as space and any ambiguous terrestrial areas, plus would proclaim that "future states" must abide by the prohibitions of nuclear weapons and non-safeguarded fissionable materials, and must promptly join the treaty. So, although the proposed nuclear ban treaty requires voluntary accession by all states before entry into force, future states could not escape its legal and geopolitical force. This encompassing of future states is unprecedented for a treaty—but justified by "all [extant] states" joining before entry into force. However, "all states" cannot simply be listed in the nuclear ban treaty text as necessary parties for entry into force, because new states may emerge in the time period between introduction of the treaty and its accumulation of all states as ratified signatories. Thus the suggested solution that the then-UN Secretary-General be tasked or requested by treaty terms to announce when, in the Secretary-General's official view and acting as the treaty depositary, "all states" have joined, which would initiate the 180-day span for entry into force (unless liquidated by a state’s formal objection within the first 60 days). Assuming then, that upon the Secretary-General's announcement of unanimous accession by states to the treaty, an established state did indeed feel compelled to make a public declaration of its beliefs about the statehood of an area that is not a treaty signatory (because is not widely recognized as a state), then the "established," treaty-signatory state could use the situation to gain some attention to its stand on the issue, but avoid delaying treaty entry into force (and would receive wide praise) by announcing to this effect: "We believe that 'X' also should be internationally recognized as a 'state,' for these reasons: … However, although it is our prerogative to do so, we will not object to entry into force of the nuclear ban treaty, because it will benefit all humanity, and the area in question is at least under nominal control of a treaty-signatory state, and the treaty's prohibitions of nuclear weapons and non-safeguarded fissionable materials applies worldwide." Taiwan, incidentally, would have to join before treaty entry into force, or China certainly would object to entry into force—which would be China's prerogative even though Taiwan is not deemed a "state" by China. "Objection" and delay of entry into force by a state could in fact be for any reason—this being an important inducement for all states (especially today’s nuclear weapon possessors) to initially join, but with any such objection being inevitably subject to scrutiny of relevance and import by all other states. Another reason for the 60-day, treaty-acknowledged "objection period" relates to the nature of a "non-withdrawal" treaty. Unlike other treaties, the proposed nuclear ban is non-withdrawal. With non-withdrawal being such a different aspect for a treaty, the prospect of having an autonomous, and treaty-acknowledged, 60-day opportunity to object (and thereby rescind that particular 180-day interval toward entry into force) would help enable leaders and legislators of states such as today's nuclear weapon possessors to sign and ratify the nuclear ban. States, as they undertake consideration of the treaty, will not know even approximately when in the future all states will have joined (i.e., as pronounced by the UN Secretary-General), and states may by that time have substantially or even entirely different legislators and executive leader(s). This "uncertainty" as to when the nuclear ban treaty would officially enter into force is also the case for any treaty, especially insofar as it requires accession by a substantial number of states (all, in the case of the nuclear ban); but other enacted treaties permit ”withdrawal" by states-parties, and therefore for treaties in general there has always been somewhat less concern on the part of states' legislators and executives that a treaty might enter into force after they are departed from their states" governance. It bears emphasis that the momentum for a nuclear weapons-free world by the time the UN Secretary-General, in virtually all conceptions, would proclaim unanimous accession by states would greatly reduce the chance that a state would then choose to rescind (within 60 days) the progress of the 180 days toward entry-into-force of a treaty to rid the world of menacing nuclear weapons. However, states should have the right to do so, to provide a less-than-repudiation option (although still in face of world scrutiny) if a state deems a delay is absolutely necessary, and as an incentive for all states, particularly today’s nuclear weapon states, to initially join the "non-withdrawal" treaty—of which the duration before its impending entry into force is unknown (but not by this to imply it would be or need be distant). It may be averred that there is little chance that "all states” would join a nuclear weapons ban, especially unless and until certain geopolitical divides are bridged. But predictions of long-term or indefinite nuclear ban treaty "holdouts" are just that—mere predictions. The realistic prospect of nuclear abolition, which is not present now but will be when the vehicle of a nuclear ban treaty [convention] is introduced for states’ signatures, would give impetus to states to find solutions or at least significant remedies to various geopolitical differences. 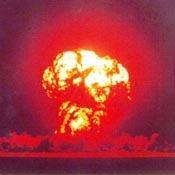 Further, and overall, the powerful, supreme reasons for states to join, even in a world such as or similar to today’s, would be the aforementioned freedom from nuclear war or attack, and freedom from possible "false-alarm" nuclear strike, and elimination of risk that terrorists could acquire a nuclear weapon from a state’s arsenal. *Frederick N. Mattis is a Soka Gakkai International-USA member and author of "Banning Weapons of Mass Destruction," published by ABC-Clio/Praeger Security International (ISBN: 978-0-313-36538-6). His e-mail is fmattis@earthlink.net.